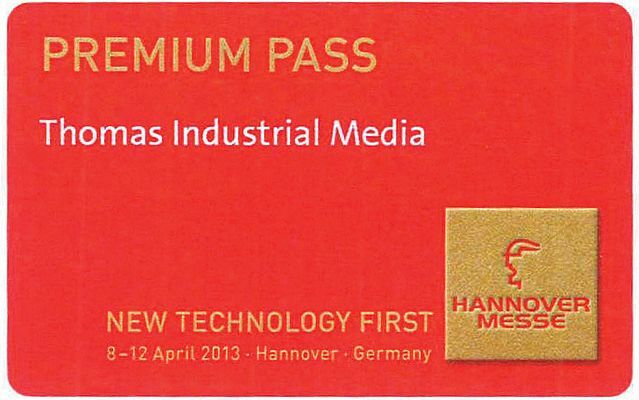 IEN Europe is giving away 30 Premium Passes for the renowned HANNOVER MESSE this April. The world's leading showcase for industrial technology lasts from April 8 to 12 2013 is held in Hannover, Germany. If you win one of the Passes (each worth 100 Euro net) you could enjoy free admission to the show and benefit from a range of exclusive services such as "Fast Lane" admission at all entrances, the on-site shuttle service, admission to the Premium Lounge with its work area and refreshments, use of cloakroom and left-luggage services, as well as the Match & Meet Registration, with which you might establish new professional contacts. For a chance to win a Premium Pass, just fill in then submit this form. Submissions must be made no later than March 15, 2013.